EFI 02, Gas pedal setup regarding pedal travel ??? My car was converted to EFI 11y ago. I don't even remember how the the carb linkage was setup or if any of it remains, it's been so long. 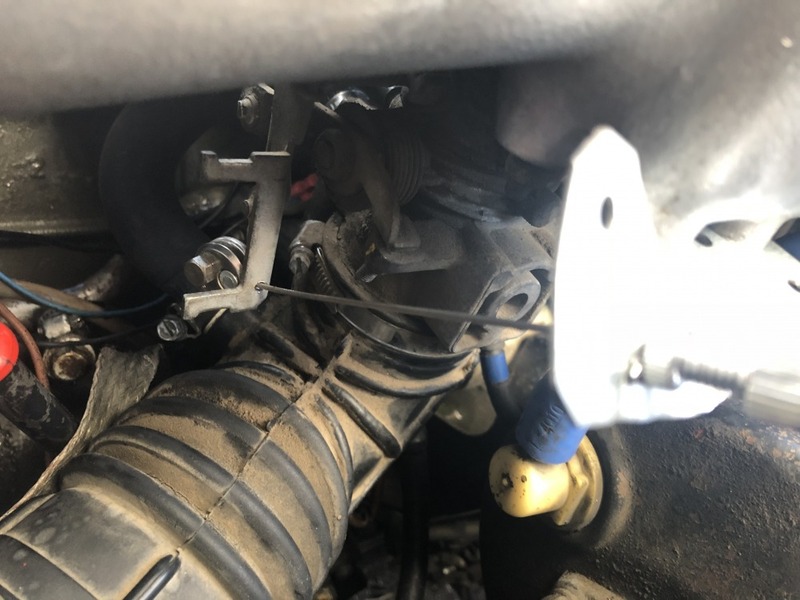 Obviously the mechanic that did this made up some sort of linkage - the gas pedal pulls on a bent rod which it attached to one of 3 positions on a lever, which in in turn eventually gets to the throttle body. I'll add pic later ! Not knowing how much of the original pedal linkage has been changed lets start with the basics. 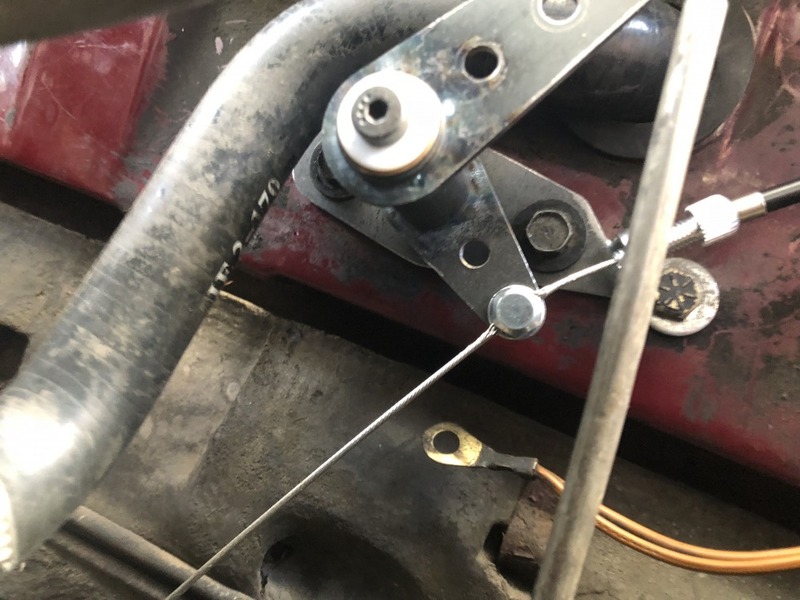 The "bent rod" that is moved by that actual pedal goes through a bushing in the pedal box, under the car you will find an arm that is attached to that rod. This attachment is a clamp on type and the end of the rod has been serrated to give it some grip. 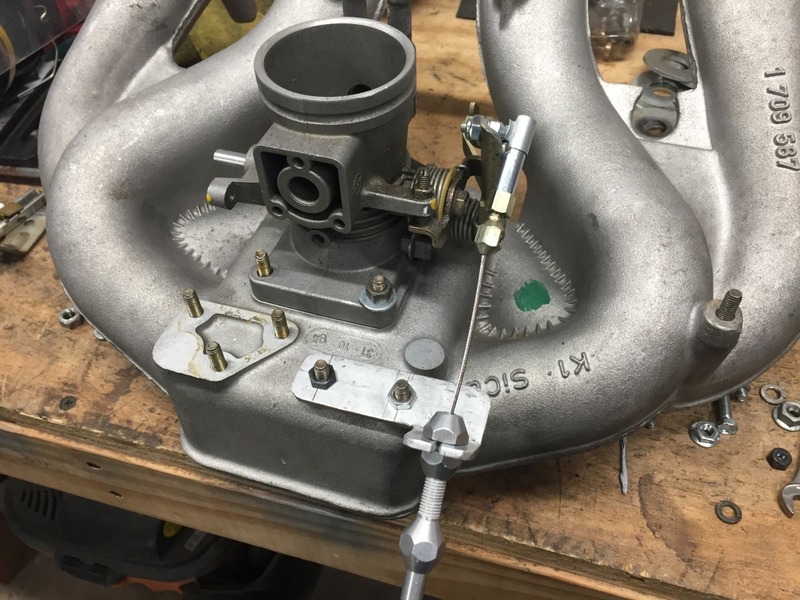 If the arm is not tight on the rod it can slip and this will cause you to have a low throttle pedal and/or not fully open the throttle plate at the manifold. 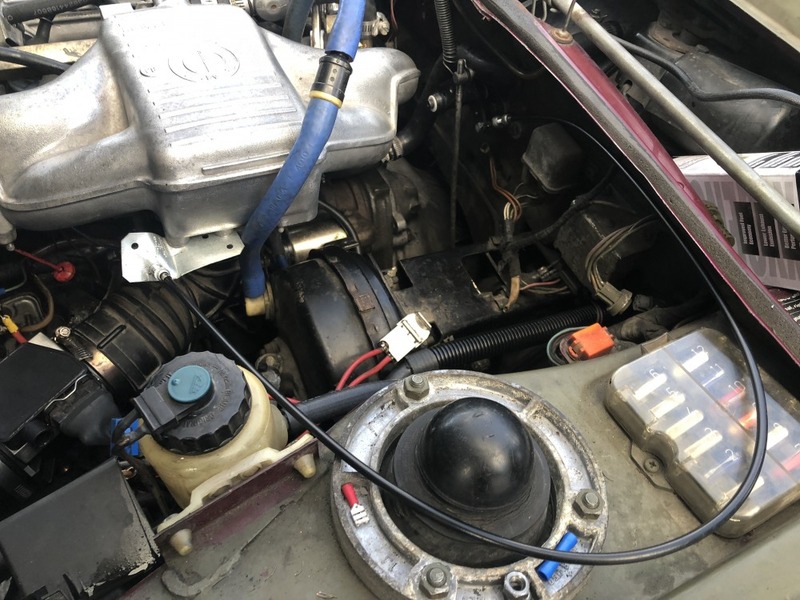 You might just need to loosen the arm and pull the pedal up to normal height (have someone hold it while you pull down on the arm to take the slack out of the throttle cable) and tighten the clamp bolt on the arm. it sounds like this cable arrangement may not have been well thought out from the beginning if it has always been "ON/OFF" you might need to change the position of the cable where it attaches to the arm at the pedal box to change the ratio of pedal/throttle plate. efi or carb....not much difference really. it is all just a lever pulling on a cable. it is a mechanical connection. if you don't have the stock style linkage, really need pics of what you have for us to help. first thing i would do is get rid of that pivot and pushrod on the firewall. extraneous junk! run the cable all the way down to the pedal box. looks plenty long enough. I used Marshall's post as a go-by and built a very similar bracket at the pedal box, a simple bracket at the TB and a Lokar 36inch cable. Only one photo available here at work but since it is the TB end, just match it to Marshall's. For travel, you can adjust where on the arm at the pedal box the cable attaches. I set mine to allow the accelerator to rotate about 30-40deg. 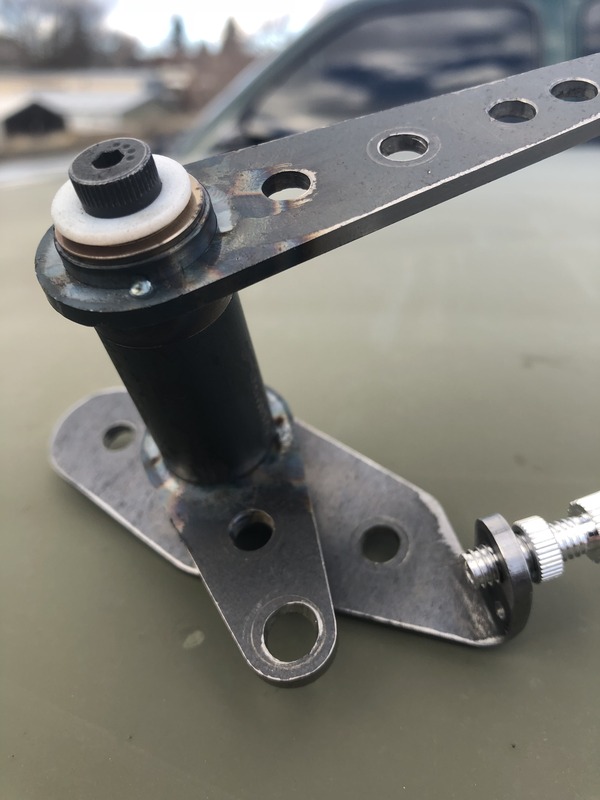 b) cut off and reweld that "TB bracket" half so it makes contact with the pin in that upper lever position, taking down the slack. or...do what we suggested. get rid of all the rods and levers and just use a simple cable as in the pictures we posted. MUCH better. I'm not against that at all, but it's not a simple deal.. Is there some sort of common conversion kit I can buy to start over ? Anyway, now I understand the problem at least... Dunno how I lived with it like that for so long! IMHO rods are a better system than cable because it's bullet proof but not in this case unless you are a math/geometry freak there is so much math that needs to go into what is a cumulative system that it's just a crap shoot for us garage mechanics, so go with the cable it's been done many times and it's stupid simple and is next to bullet proof. This is my prototype, will be making these kits for the EFI conversions. pedal box bracket is just a bent piece of metal, as is the bracket on the TB. the cable can be had from any speed shop(think carb throttle linkage) or a bicyle shop (same as components as bicycle brake/shifter parts), or i believe the throttle cable from an 80's honda civic works. WAY simpler than trying to make a pushrod linkage work!!! !